Perfect Winter Gifts for him / her! Winter is coming.The world of ice and snow is both chilling and fascinating. So get a pair of reliable winter gloves to explore the wonderful world is a must for anyone with passion. 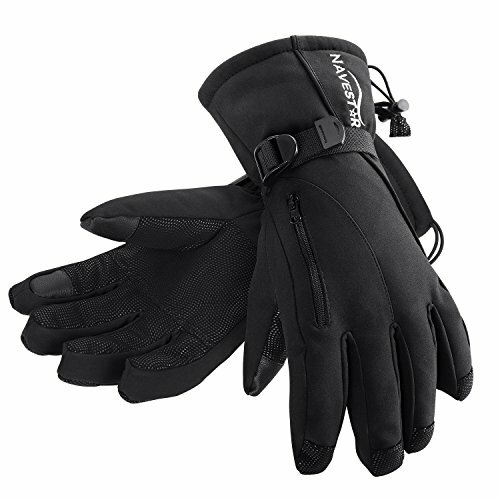 Navestar snow gloves are specially designed for winter sports enthusiasts and people who work outside in winter. Made of Bonded Polar Fleece and high quality cotton, Navestar Thermal Glove is very comfortable and skin-friendly to wear. And it is long enough to cover your wrist up to the end of your long sleeve for full insulation. With its adjustable buckle strap and elastic drawstring close, it is a ideal skiing gloves for both men and women of different hand size. Definitely an ideal winter gift for your lover, family or friends. Navestar winter glove, warm his / her hands as well as his / her heart. Soft full covered leather palm ensures strong and flexible hand grip in skis or snowmobile handles. Our size chart has been carefully designed to offer you better fit so it won’t be bulky if you refer to it. Touchscreen fingers enables you to use your mobile phone with your gloves on. 2.Hand wash is more recommended to keep its long thermal performance.